Today I am loving … this simple white bedroom with four poster bed (image source unknown). 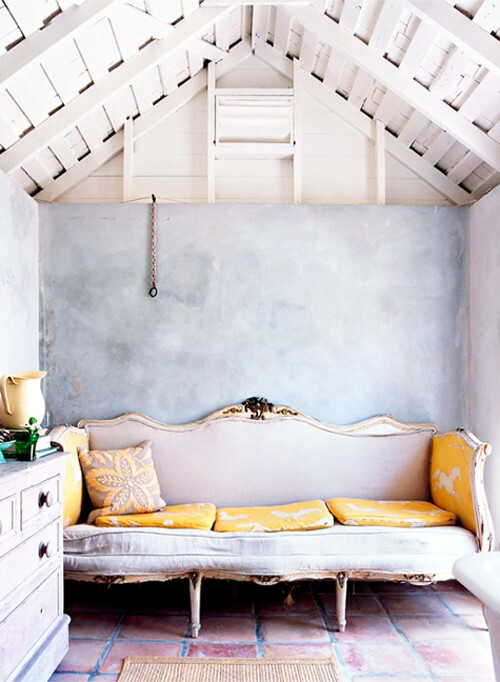 And … this cottage room with beautiful sofa (image by Virginia McDonald). These two pictures are really lovely and inspiring! Love the four poster bed as well as the French settee!Mmmmm!!! loving these pieces against the crisp white walls its simple yet classic and i am wishing i had those tall ceilings in my farmhouse! Thanks for the inspiration. Great choices … I love what the chandelier lamp adds to the bedroom. The first bed is lovely. Very romantic. I think you should change the title to “More inspiration that you can possibly handle”. Gorgeous, gorgeous, gorgeous! Okay, I couldn’t resist. I had to repost this lovely bedroom today. Have a beautiful day! I thinks it will be more beautiful if its four wood corners will have added designs. For example, a cloth with accented designs or a beads curtain will enhance the bedroom area.